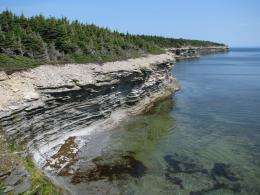 (PhysOrg.com) -- In the Late Ordovician Period of Earth's geologic history, about 450 million years ago, more than 75 percent of marine species perished and Earth scientists have been seeking to discover what caused the extinction. It was the second largest in Earth's history. Now, using a new research method, investigators believe they are closer to finding an answer. Employing a new way to measure ancient ocean temperatures, a team of researchers at the California Institute of Technology (Caltech) recently discovered a link between ancient climate change and the Late Ordovician mass extinction. The team found the extinction event occurred during a glacial period when global temperatures became cooler and the volume of glacial ice increased. Both the changes in temperature and the increase of continental ice sheets are factors that could have affected marine life in these ancient waters, said Woodward Fischer, an assistant professor of geobiology at Caltech. "Our tools are getting better to ask more questions about ancient climate, so we're really shaping our picture of what that world was like," he said. In the past, measuring ancient ocean temperatures was based on measuring the ratios of oxygen isotopes found in minerals from ocean water. The challenge was knowing the concentration of isotopes in the ocean at that time, which was needed to determine past water temperatures. But, because there is no direct record of the isotopic composition of ancient oceans, it was difficult to determine the water temperature. The new method, developed in the laboratory of John Eiler, Sharp Professor of Geology and professor of geochemistry at Caltech, determines the temperature of the ocean by examining the spatial organization of isotopes in fossils that existed in the Late Ordovician Period; in particular, the method looks at the extent to which rare isotopes group together into the same chemical unit in a mineral structure. This new method "requires really well-preserved minerals, so we used fossils," explained Fischer. "Shells are ideal for this technique." Fossilized marine species shells were used from present-day Quebec, Canada, and from the mid-western United States. Fischer said the types of species that went extinct during the Late Ordovician Period included mostly benthic invertebrates, or invertebrates that live on the ocean floor and filter plankton for food. These were organisms such as trilobites and brachiopods. Paleozoic corals and cephalopods, which Fisher described as resembling "squids in a tube," were impacted as well. Some vertebrates, primarily fish, also were impacted by the change in global temperature, but fossil evidence of these organisms is less common. Eiler explained that the findings of this study revealed that during the Late Ordovician, the temperatures of tropical oceans were higher than they are today, but for a brief period, experienced a drop in temperature by five degrees. At the same time, the volume of ice in the poles expanded. After this glacial period, the ocean temperatures rose, and the ice volume returned to its earlier, lower amount. "We've observed a cycle of climate variability," said Eiler, who explained that these findings can be used to learn more about changes in climate today. 1. "Earth's Heat Source - The Sun," Energy & Environment 20 (2009) 131-144. It's been shown the Earth's magnetic poles 'flip' every so often. This can't be pretty. Minus the occasional (but inevitable) dinosaur-killing meteorite, the ( I want to say high-sulphur[?] content in) oceans between transitions have got to wreak havoc on fish/animal life. Can anyone dare to guess the length of the "flipping" process? Millenia, maybe even decades?